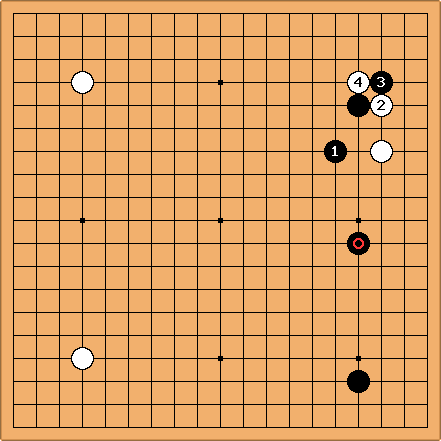 Alex Weldon: I was playing the Manchurian Fuseki on IGS, as I usually do with Black, but instead of playing under my 5-4 stone, White jumped into my moyo on the other side. I wasn't quite sure how to answer, since there are (AFAIK) no joseki for a 7-3 approach to a 5-4 stone. This move doesn't seem particularly good to me. It's a moyo invasion, but it seems too early, and one is generally supposed to play at the 3-4 point under a 5-4 stone. If he wanted to invade so soon, surely he should have played at the point of symmetry one line lower. 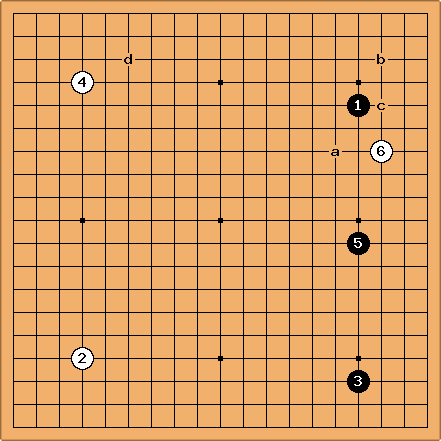 a: A capping move as an attack. Problem here is that with the direction he'll probably play, it looks like I'll be building "territory" on the upper side while attacking, except it won't really be territory, because the 5-4 stone is too high up and he can still jump in underneath. b: Take the corner, let him jump out, then chase him, and now I really will be able to make some territory on the upper side, since I've closed the corner. Problem here is that it feels a bit mild, not putting enough pressure on his stone. Nonetheless, this is what I played in the end, and went on to demolish my opponent (for other reasons... this was hardly the game winning move). c: A solid move. Puts some pressure on his stone, and though he could still invade the corner later, it will be less bothersome to me. Problem here is... I don't know. It just doesn't look good to me. I rejected this idea quickly. d: Tenuki. Maybe this is what I should have actually done. Maybe if your opponent does something strange, but it doesn't look immediately threatening, you should just ignore it. He'd probably play at c then, and settle quickly while I'd build some thickness facing the upper side to help my kakari stone. He wouldn't want to invade the corner under the 5-4 stone now, because after playing through a joseki, his original stone at 6 would end up being too close to my thickness. Anyway, this is a classic case of "opponent plays a move that is probably bad, but it's weird enough that you're not quite sure what to do about it." What would you do? Charles Matthews This diagonal attachment Black 1 really ought to be the first pattern to consider. One can't conclude it's necessarily correct, because of the remaining aji at a. But what it does is to make the marked black stone into an attacking stone immediately: it's consistent. 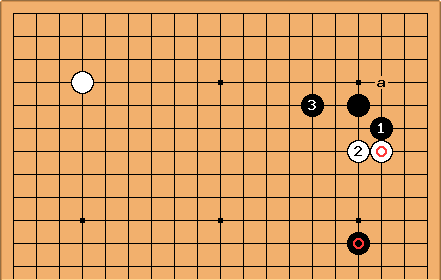 From the point of view of taking the corner, and nothing else, playing the square-marked black stone would be better. That would make it much easier to kill the invasion at a or the 3-3 point. This is a kind of good-shape play, therefore. 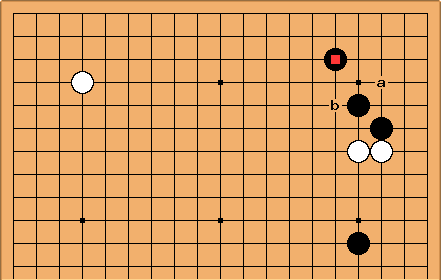 But now White at b is pretty much kikashi for White, and Black's attack on the outside is not going to be anything like as strong. 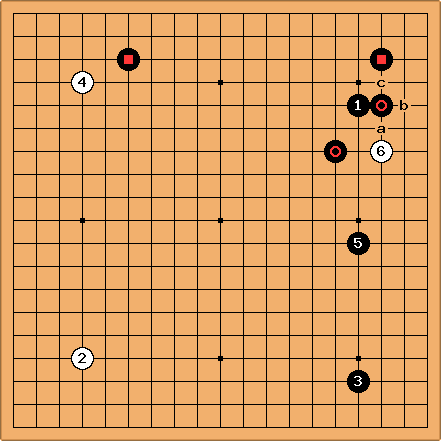 This way of playing goes back to Shusaku - of course that doesn't mean it's best here. If you already had one of the stones on the board, and White played , would you respond with ? No. Therefore, these plays are dubious, the 3-3 particularly so. Any tenuki is questionable, here. OTOH, if you already had one of the stones on the board, would be a reasonable reply to , and the other Black stones look OK, too. B a (as Charles points out) and B b are possible, too, but leave a weakness at c.
If Black plays the cap at , White may attach and crosscut with and . The fact that the corner is so large makes this difficult for Black. It is hard to trade the corner for the side. If Black plays at 4 instead of 3, White plays at 3, and starts to look questionable. Alex Weldon: Thanks to both of you for the help. Bill's comment in particular about imagining reversing the order of moves is something that I'm aware of, but almost always forget to apply in the context of a game. I suspect that trying to remember to think about such things will improve my game significantly. rubilia: I am far less confident about go than Bill, but, from a logical point of view, I´d like to remark that the "reverse-best" move doesn´t HAVE TO be the best move in the actual game. (However, in many cases probably it is).